Check out Tobi's Danielle Lace Up Bodycon Dress Dance the night away in the sexiest lace up bodycon ever. 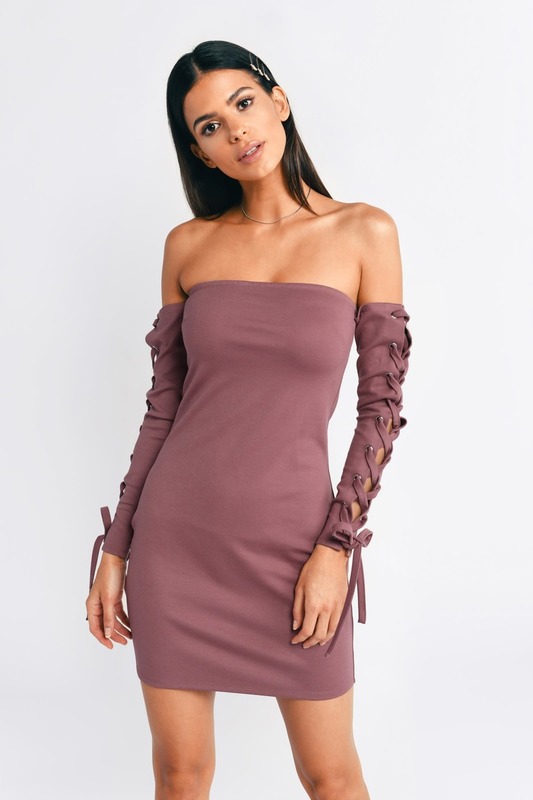 The Danielle Lace Up Bodycon Dress delivers attractive lace up sleeves and an off the shoulder neckline to show off those shoulders. This edgy, tight fitting Dark Rose dress will make you the center of attention, we promise. Dance the night away in the sexiest lace up bodycon ever. The Danielle Lace Up Bodycon Dress delivers attractive lace up sleeves and an off the shoulder neckline to show off those shoulders. This edgy, tight fitting Dark Rose dress will make you the center of attention, we promise. Dance the night away in the sexiest lace up bodycon ever. The Danielle Lace Up Bodycon Dress delivers attractive lace up sleeves and an off the shoulder neckline to show off those shoulders. This edgy, tight fitting Black dress will make you the center of attention, we promise.